Medication For Gout Aftercare follows my last article: Starting Gout Treatment Guidelines. It’s the opposite end of the gout treatment process. Once you have gout under control, it’s no time to be complacent. See Medication For Gout Aftercare summary. You need to continue monitoring your uric acid levels. That way, you will stay free from gout pain for life. You have controlled uric acid safely below 5mg/dL*. You have had no gout flares. As we shall see, this is usually the easiest part of controlling gout. Like most maintenance jobs, a few minutes a year is all it needs. But, beware! Do not be tempted to overlook monitoring your medication for gout. If you allow uric acid to start building up again, you will be back where you started. In fact, you will be worse than when you started controlling gout, as you will be older, and more damaged. The previous step in your gout treatment plan took a minimum of six months. Monitoring your medication for gout takes a lifetime. All you need is a simple blood test, at least once a year. That should monitor uric acid, liver function, and kidney function. Most of the time, there will be no change. Occasionally, something might signal to you or your doctor that it’s time to improve your medication for gout. >Keep moving forward. Improve your medication for gout as time passes and situations change. Are your uric acid levels still safe? In the gout forum, Evgeny questioned if he might reduce his dose of febuxostat (brand name Feburic). As I write, I don’t have enough information to know if it is the right time to consider this. We can only consider Medication For Gout Aftercare after we have reduced the burden of uric acid crystals. This applies equally to all gout medications, whether pharmaceutical or herbal. But, there are never any fixed rules. New gout medications are available. New professional recommendations on safe gout treatment. Do not be like my friend who reached his eighties thinking he’d done everything right by taking his daily allopurinol. Years turned to decades, yet his doctor never reviewed his medication for gout. His final 2 years were misery. He thought he’d done everything right. He did not know about new treatment guidelines and the need for annual monitoring. Why would he, if nobody told him?! So, I’m telling you. Do not stop your medication for gout aftercare, just because you feel great. Pester your doctor for annual reviews. When you do need to make adjustments to your medicine for gout, make them slowly. Gradual change and careful monitoring will keep you safely free from any fear of gout. As you get checked and reviewed, post your results in the gout forum. That way, you encourage thousands of fellow gout sufferers to take the right course. You show the world – gout control is easy when you do it right. In this series, I have created a general template for gout control. Every gout patient needs their own personal gout treatment plan. Your doctor might have already created a template for you to customize. If not, you can customize my general plan to create your personal plan. Throughout 2016, I will provide more specific templates based on input from GoutPal members in my gout forum. If you need help to customize your personal gout treatment plan, please ask in my gout forum. Leave Medication For Gout Aftercare to browse the Gout Treatment Guidelines. * In this article, I use 5mg/dL as the usual safe uric acid level. In your life, you should have your own safe level. You should agree different target levels with your doctor at different steps in your gout treatment plan. If you have to accept levels that are over 5mg/dL (300μmol/L), then you should know the reason, and manage the additional risks that implies. 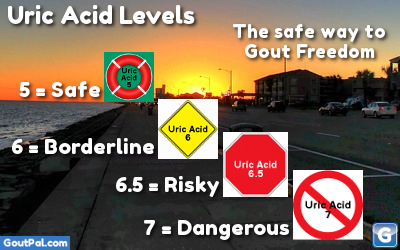 If you don’t know your safe uric acid level, let’s discuss it in the gout forum. Medication For Gout Aftercare summary. Do not relax until you've gone six months with safe uric acid and no gout flares.